Based on the Dreamworks animated film, Shrek is back for its second major UK tour starting in late 2017. The first Shrek UK Tour was seen by nearly 800,000 people visiting 25 major venues over 20 months. Read our review of the last Shrek tour. Join our unlikely hero Shrek and his loyal steed Donkey as they embark on a quest to rescue the beautiful (if slightly temperamental) Princess Fiona from a fire breathing, love-sick dragon. Add the diminutive Lord Farquaad, a gang of fairytale misfits and a biscuit with attitude, and you’ve got the biggest, brightest musical comedy around! Featuring all new songs as well as cult Shrek anthem I’m a Believer, Shrek The Musical brings over 100 much-loved fairytale characters, plus a 14-foot dragon, to life in an all singing, all dancing extravaganza. The UK Tour of Shrek is directed by Nigel Harman who played Lord Farquaad in the Theatre Royal Drury Lane production. Nigel Harman says: ‘I had so much fun directing the original UK & Ireland Tour that I jumped at the chance to work on it again. 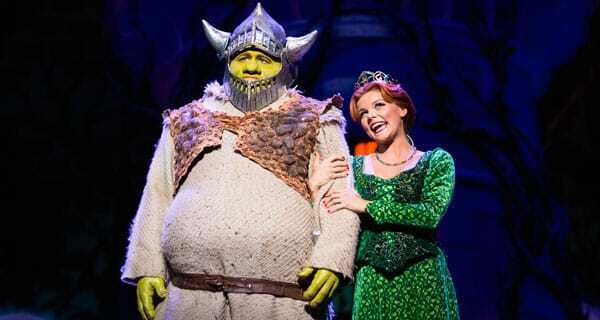 Shrek the Musical has created pivotal moments in my career – firstly winning an Olivier and then my directorial debut. It’s certainly become one of the classic family musicals of all time and I’m really proud to be a part of it’.